As the WEMBA East folks get ready to graduate today, us on the West Coast are celebrating our first weekend after our graduation ceremony. It has been a peaceful week of plentiful sleep, and unhurried focus at work and in other aspects of our life. So while we raise a toast to celebrate the graduation of our WEMBA East family members, here’s a quick summary of what transpired last Sunday. 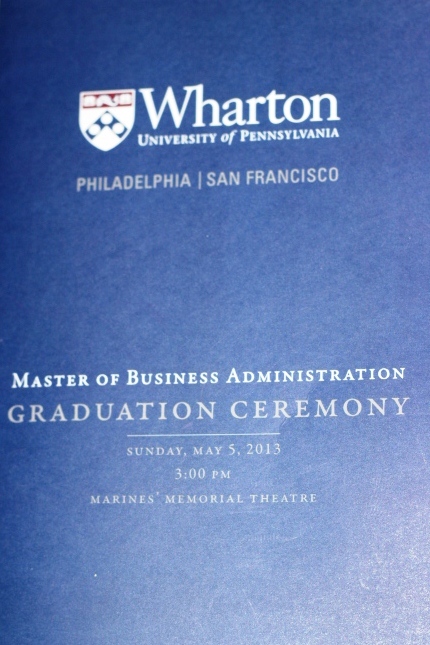 Seismic retrofitting at the Herbst Theater meant that this year the Wharton San Francisco graduation ceremony had to be moved to the Marines’ Memorial Theater, an equally impressive building. The day began with an open house at school where all of us took our families, took pictures with them and showed them where a significant portion of our lives was spent in the past two years. The day was a bit chilly and cold but it cleared up to offer us the beautiful views of the Bay that we so wanted to show off to all our families. Relief, pride, joy, and a bit of nostalgia – these emotions were among the many that ran across the faces of my classmates as they took one last walk around campus as students and then headed out to get lunch before heading to the graduation venue. After spending about an hour taking photos of each other and on figuring out how to wear our graduation gowns and avoid any wardrobe malfunctions, we finally lined up outside the theater, ready to walk in with pomp and circumstance. It was fun to see the professors in all their interesting regalia. I believe David Bell was actually wearing sneakers .. got to be a Stanford PhD tradition. It was also interesting to see that the professors that were PhD holders from Chicago had non-square caps that looked sort of cool, amidst the sea of square caps that we had to wear. We spent a good few minutes standing in the front rows, facing our families and waving to them, applauding them for their tireless support over the past two years. This degree was as much an accomplishment of theirs as it was ours. Many had brought along their sponsors from their companies as well to thank them for their support. Doug kicked off the evening with a special award to Len Lodish for vision in helping start Wharton SF and the years of support that he gave the school. Dean Robertson followed next with five key lessons for us – “Be curious”, “Get a life”, “Its not all about you” and a couple more that was lost in the excitement of the day. Inder Sidhu, the keynote speaker from Cisco provided a few vignettes from his life through the examples of his mother, wife and daughter and how that brought to bear three key lessons for him – courage, caring and curiosity. It was pretty interesting to hear how these experiences shaped his career. After the awards were done, we also had the class gift committee hand over a check for over $125,000 to Wharton as a contribution from our class. Several classmates made big donations and we had a couple of matching donations as well. What was really cool was that we had 100% participation from the class. To use a Seinfeld analogy, for those of us with kids who’s families had not come to school much, the graduation dinner presented with the ultimate George Costanza moment. There’s the Wharton student, and then there’s the parent or the spouse, and these two worlds were hitherto fairly non-overlapping. It was interesting to see how my classmates managed to alter between those two roles successfully, talking to their kids and spouses for most of the dinner, and yet, finding time to walk around to other tables as well and meet and greet other classmates and their families. I’ve not been big on ceremonies in general but looking back, I realize that the formality of this process serves as closure in our minds – that we are now MBAs, that for better or worse, we have acquired skills that we could use, or lose. It will be interesting to see how my classmates progress through their careers and lives and go on to do amazing things in the coming years!